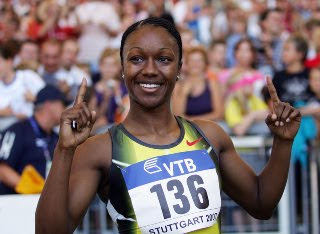 Carmelita Jeter - the world's second fastest ever woman over 100 metres - will race at the National Indoor Arena in Birmingham on February 20. Jeter won bronze at the World Championships in August and a month later went on to record a fantastic time of 10.64 seconds in Shanghai - a time only bettered by Florence Griffith Joyner's stellar world record of 10.49sec. Now she is hoping to retain her 60m title at the Aviva Grand Prix where last year she set a blistering new personal best mark of 7.11sec - the quickest of the year. The American star said: "I can't wait to return to the National Indoor Arena for the Aviva Grand Prix. I had a great time there, winning the 60m in a new personal best for me. "There was a very strong field of names in the line-up and I've no doubt that this season's Aviva Grand Prix will be the same, which means it will be tough to retain my title. "But it's a challenge I relish and am up for." Jeter also has an eye on the London Olympics in 2012 and she is relishing the opportunity to visit Birmingham as many times as possible ahead of the Games, due to the fact it will be the holding camp for the US Track and Field team. "One of the best things about returning to Birmingham is that it gives me an opportunity to familiarise myself with the city in the build-up to London 2012. "I hope I have the opportunity to see a bit more of it when I visit in February; it's definitely a great place to have a holding camp for the Olympics."